Home Specials 30% Off + Free Shipping Until Christmas! 30% Off + Free Shipping Until Christmas! Back in the 1950s, French ear specialist Dr Alfred Tomatis started developing a method of using one’s own voice to train your brain, and it was my own experience of using a Sound Therapy program based on some of his methods (though not the voice activation or bone conduction parts) to improve issues that were supposedly incurable which launched me into moving out of IT and into natural therapies. short term memory, which impacts skills such as reading, writing and even chatting. The school holidays are a great time to work on improving these areas, so students can return to school with more confidence (though it is great for adults who need help in these areas too!). 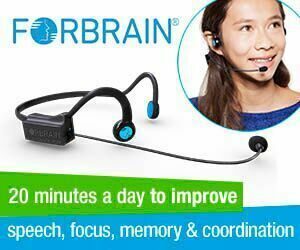 From now until December 24, ForBrain are offering 20% off plus free shipping; but if you order through this link, you can get an extra 10% off, giving you 30% off plus free shipping! It is a super simple device to use. Just put it on, and read out loud or sing with it on, for just 20 minutes a day. For teens and adults, there is an exercises booklet you can refer to for more ideas and activities.